Seriously, all this food for under $7.00?! Hooray for souk! Thomas and I were talking the other day about beets, man. That’s right, beets. Or barba, if you want to use Darija (but not to be confused with the amazing 1970s children’s book character, Barbapapa). Anyway, we were going on and on about how much we enjoy eating beets in Morocco (yes, we have time for these types of conversations now). But seriously, there are a number of valid reasons this unassuming veggie has become such a staple of our diet: they are quite healthy, they are easy to prepare, they taste lovely cold (and we are eating mostly cold things now that the weather is getting hot), they are very versatile (add them to smoothies! Put them in salads! Eat them in sandwiches! ), and (perhaps most importantly) they really are the most gorgeous color a food could be. Like jewels, I tell you! 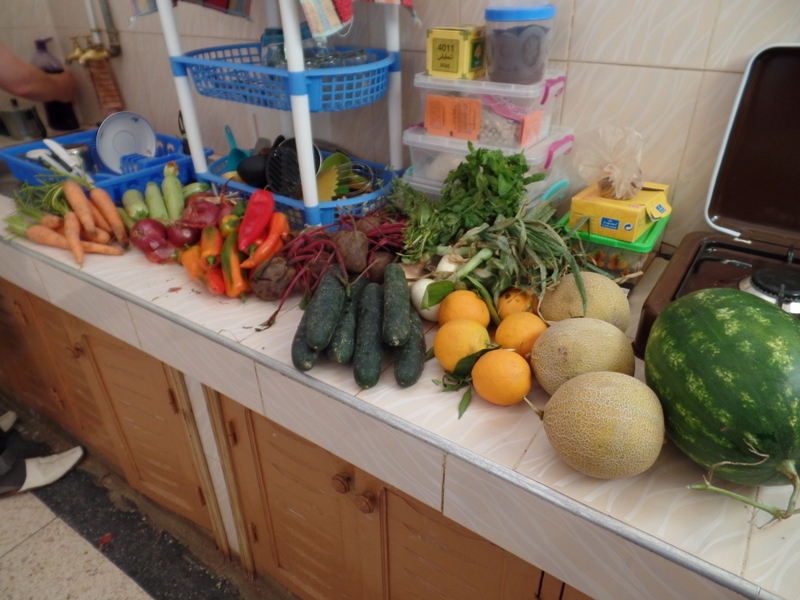 They are also incredibly affordable here—about 40 cents per kilo. Amazing! Since moving into our own place, our beet consumption has become somewhat prolific. I boil a batch of beets at least three times a week, season or marinate them in some sort of vinaigrette, and then we eat them with both lunch and dinner. And yes, our pee is pink to prove it. “But one cannot live on beets alone!” you may be thinking. Yes, that’s true, which is why we also eat lots of other vegetables. But there are almost always some beets to accompany them. OK, it’s the same stuff, but from this angle you can see the beets, cucumbers, and peppers better. Do you see the beets? They’re right there in the middle, patiently waiting to become a salad. God bless ’em. 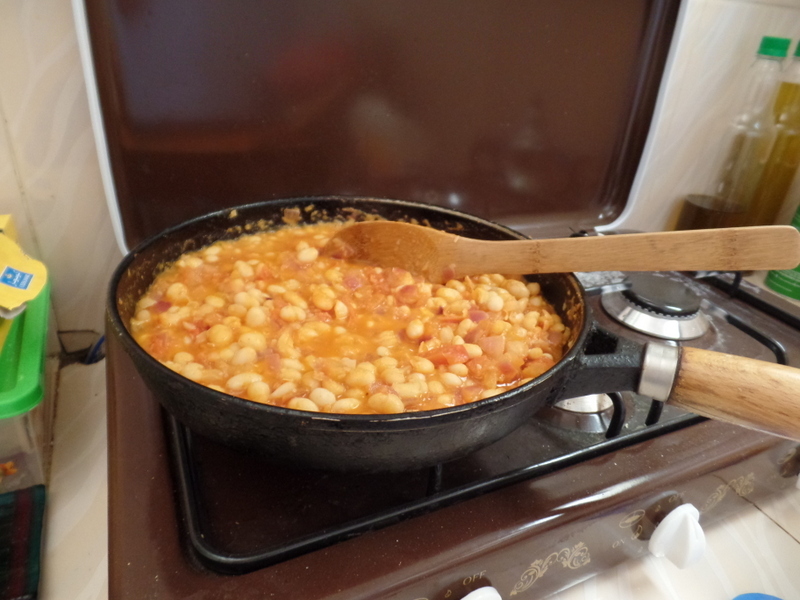 Lubia: While Bean and Tomato Stew. I should note that this pairs beautifully with a beet salad. Just a suggestion. Tonight for dinner I am making lubia, a really lovely white bean and tomato stew, which I plan to serve at room temperature. We will enjoy this main dish with some cucumber salad and some sparkling water. 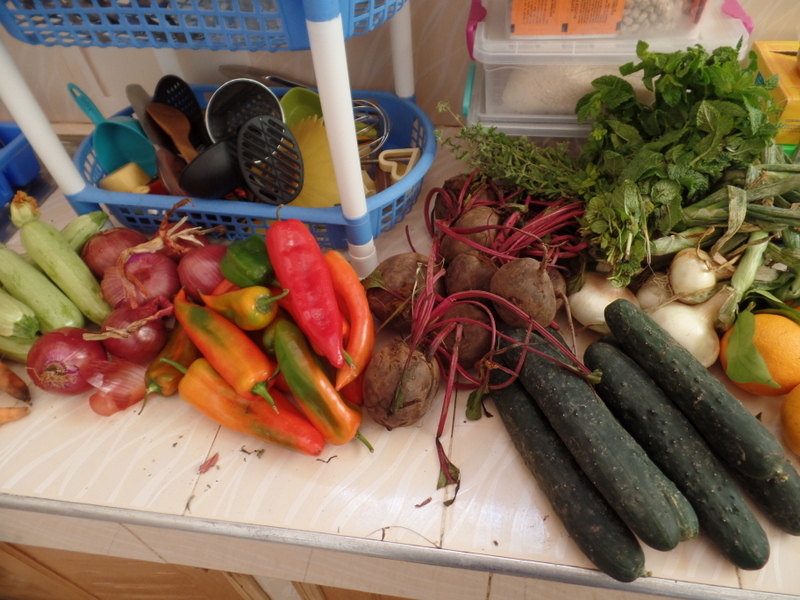 Oh yeah, and some beets. I can hardly wait! Like jewels, I tell you! Erika you have a way with words, I tell you! This post makes me think of our haggadah that says some vegetarians like to use a beet on the seder plate instead of a shankbone. “Tonight we eat beets to honour the dark part of all cycles of life. Blessed is the root that grows in the darkness, connects us to the earth and nourishes us.” and then the instruction: Eat beets. Yes for beets! I actually did one of my classes with seniors with all beet recipes. The included a wonderful beet jam – something they make regularly in Eastern Europe. Of course it means cooking for a bit, then then you would have it. The other vegetables look wonderful. So glad you can eat as you choose, when you choose – cozy on your bed.